The lappish winterS : Or when to come to Lapland? With a mean temperature of −1 °C (30.2 °F), Luosto lies just north of the 0 °C (32.0 °F) mean annual isotherm and experience a subarctic climate, with short, mild summers and long, freezing, snowy winters. The winter officially lasts from November until End of March, but there is still plenty of snow until beginning May (and sometimes even later). Off course, conditions will vary a lot during those 7 months, in term of snow quantity (and quality), temperatures, and daylight length... So it is important to select carefully "you winter" depending on the activities you want to experience in Lapland. 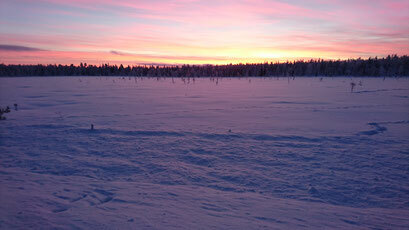 Kaamos is the dark time of the Lappish winter, when the sun barely rise above the horizon, or even doesn't rise at all. At the darkest time of the year, it will be relatively light from 10am until about 3pm. (the picture on the left was taken the 14th of December 2015, at 14.20. the sun is already under the horizon...). Actually the darkest time of Lapland is usually not the coldest. You can usually expect anything from -5C to -20C, so nothing too bad if you have good gear. Oddly enough, this time of the year might not be the best for northern lights watching : nights are long and dark BUT December is also usually the time we get the snow, so you can have quite cloudy weather for days and days, preventing you to see the sky. But, if you get clear sky, you will experience some of the most beautiful landscape you will ever see ! For all the other activities (snowshoeing, skiing, sled dogs, and much more) Kaamos is good, and it is even a funny experience to finish the snowshoe trek around 3pm, already in the dark! From mid-January to end February : the arctic winter. Now THIS is winter ! Cold, very cold, even if the daylight is already becoming longer. And don't let yourself be fooled even by a "mild -15C"! In south Europe, in any Alpine ski resort for example, the coldest temperature of the day is usually measured at 5-6am, and then it raises a lot as soon as the sun shows up. So people remember -15C, but real temperature around 10am on the skiing slopes is already around -5C ! The average January temperature of Val-Thorens (highest ski resort in Europe) is -4C ! 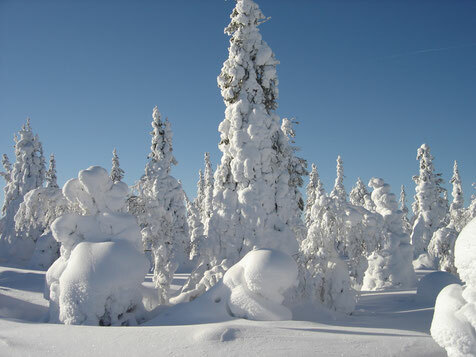 But once you are equipped to cope with the cold, this time of the year in Lapland is just incredible! Amazing winter landscapes, powder snow everywhere, and the utter silence of the arctic...So hike, ski, snowshoe, but just go out, and enjoy the great outdoors! This time of the year is also probably the best for northern lights watching : the nights are still long and dark , and usually, cold weather means clear sky, so the chances to see northern lights are better at this time of the winter than earlier, during the Kaamos. Just remember that children don't cope well with extremely cold weather conditions (less body fat, more sensitive skin, lower weight and therefore less warmth inertia...) and therefore most of the local companies drastically limit the range of activities available for children when the temperatures go under a certain limit (usually -20C). At this time of the year, it is not uncommon to have under -20C for a few days or even a week, so don't take any risk , and if you want to come to Lapland with young children, come before or after the coldest time of the winter. End of winter and springtime are really good times to enjoy the outdoors in Lapland. Days are getting really long, weather is usually very sunny, and daytime temperatures come often above 0C. But there is still plenty of snow, and if night-time temperatures drop enough (sometimes down to -15C), this gives us the ultimate dream of the winter hiker : the hanki (finnish word describing this real hard snow crust forming itself on top of the snow layer), which permits you to stay right on the surface of the snow, even without skis ! (the picture on the left was taken beginning of April and my dog Mosku, 43kg, and was pulling me and my pulkka without sinking at all...). So this time of the year is definitely the best time to do long (full day, or multi-days) skiing/snowshoeing trips. It is also the best time for ice fishing (taking a nap on a reindeer skin, enjoying the sun on a frozen lake is something special). 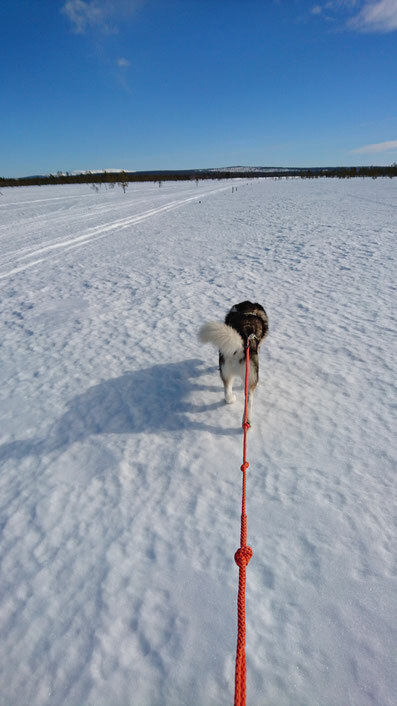 Finally, this time is also the best time if you want to come with young children in Lapland : temperatures are mild, days are long, and there are plenty of things to do as a family. The only problem will be for northern lights "hunters" : In spite of having big chances to have clear night sky, days become longer, so nights become shorter, and not so dark anymore (the sun doesn't go so far under the horizon line), so if you want to see good northern lights, try to come before the 20th of March... After that, you can still see some northern lights, but quite late (in April it is not really dark before midnight), and with less contrast than earlier in the winter.